For the past three years, Grace Blakely has been desperate to find out the truth about her mother's murder. She thought it would bring her peace. She thought it would lead her to answers. 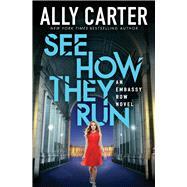 She thought she could put the past to rest.But the truth has only made her a target.And the past?The only way to put the past to rest is for Grace to kill it once and for all.On Embassy Row, power can make you a victor or a victim; love can turn you into a fool or a fugitive; and family can lead you forward or bury you deep. Trust is a luxury. Death is a very real threat. And a girl like Grace must be very careful about which secrets she brings to light.